As with most pastries I try to make, the first thing to do is the conceptualisation. I kept the composition simple and the tartlets comprise of 5 components, i.e. 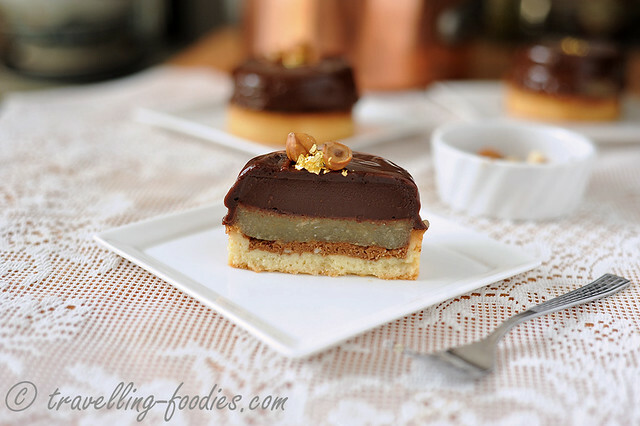 a standard pate sucree as the base, praline feuilletine au speculoos at the bottom for the crispy and nutty textures, and then a layer of gelee au feijoa, followed by a ganache au chocolat noir and finally a glacage au chocolat. 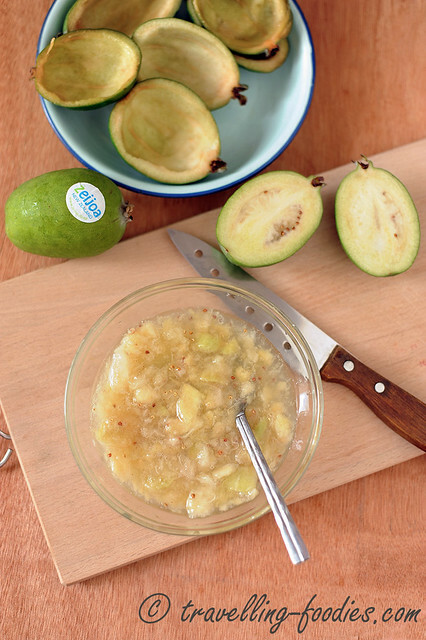 The feijoas used have to be ripened for the tarts to work beautifully. Unripe feijoas has a more fibrous core as seen in the photo above, void of the gelatinous innards as in the earlier photo. Ripen feijoas should yield so every slightly when one attempts to press on the exterior. Unipe ones would just be hard like guavas. But should one slice through a feijoa to realise that it is one or two days too early to have done so, all is not lost. The flavours of the fruit can be accentuated through maceration, which simply requires some granulated sugar to be added to the scooped out pulp and left covered for a few hours in the fridge. I left mine chilled overnight and next morning, the flavours mellowed wonderfully. 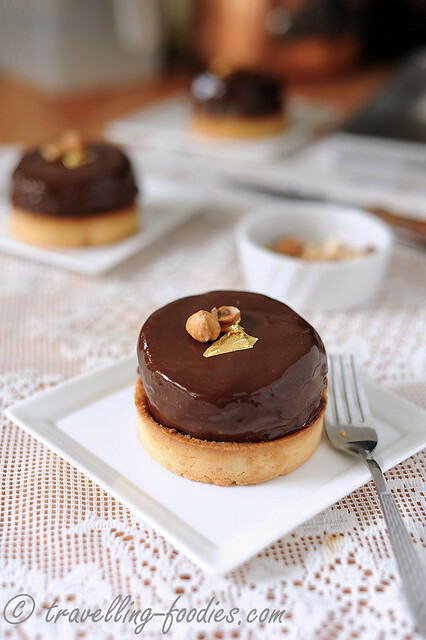 For the tartlets, I’d used two types of tart rings, the larger ones for the sweetcrust pastry base while the smaller ones were used to set the gelee and ganache. 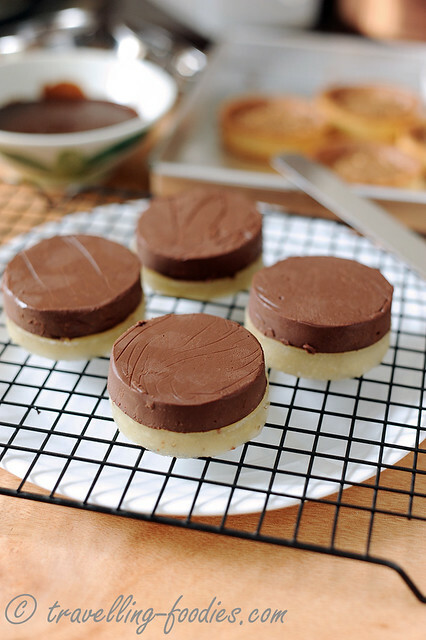 Alternatively, the gelee and ganache layers can also be cut out with pastry or cookie cutters once they have set. So it is not an issue if one doesn’t have these different types of tart rings. The macerated feijoa pulp is then pulverisedand heated it to 65 degrees Celsius before reconstituted gelatine was added. Since this is a really new fruit to me to experiment with, I’m not entirely what effects the enzymes in the fresh fruit would have on the proteins in gelatine, as how those in fresh kiwi would break them down. So I’m not taking chances on that. The heated concoction is pour into the tartlet rings which double up as moulds here as I’m trying to minimise attrition. These feijoa jelly discs were left in the fridge to set overnight, together with the sweet crust almond pastry dough. 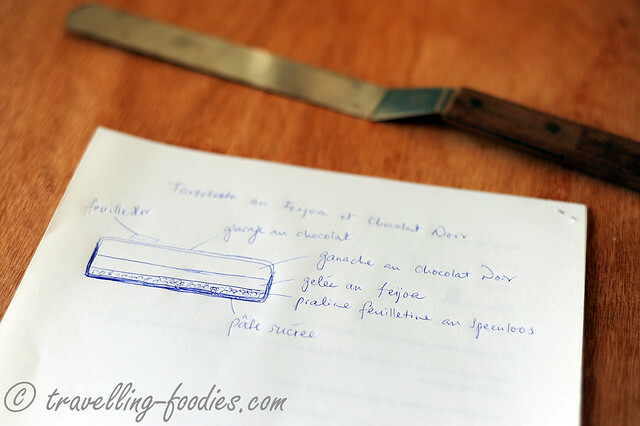 The praline feuilletine layer is easily made with just four components, i.e. chopped hazelnuts, gavotte biscuits, melted milk chocolate and praline paste. 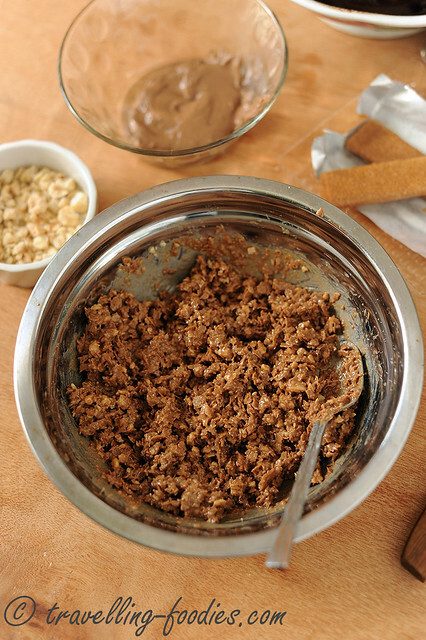 Traditionally, praline paste is made from ground hazelnuts but I’d decided to use speculoos instead! The milk chocolate can be melted in a microwave or over a bain marie. Otherwise you can do what I did, i.e. to leave the the chopped milk chocolate chunks in a metal bowl placed on top of my heated oven while the tart bases are baking inside! After the milk chocolate has nicely melted, it is mixed with crushed gavotte biscuits followed by chopped roasted hazelnuts and the speculoos paste. The tartlet rings were dislodged from the feijoa jelly and used to set the prepared dark chocolate ganache. Those familiar with pastry making would know that ganache can be made easily by pouring hot cream over a bowl of chopped chocolate. Some time is given for the chocolate to melt before mixing well. A little butter and salt is added at the end to give the ganache a luscious taste and beautiful shimmer. After the chocolate glaze is prepared, the tartlets are now ready for assembly. I’d planned to brush the interior of the tartlet shells with a layer of chocolate to prevent the moisture from the feijoa jelly from coming into direct contact with the pastry crust but later found it be unnecessary. But one can always do with some caution here. so it is entirely up to the individual to take the risk or not. 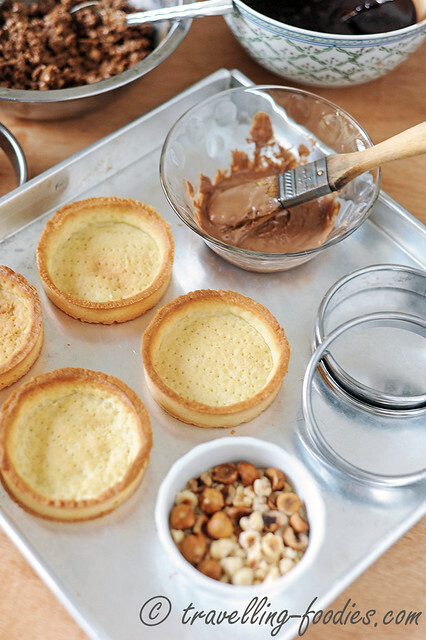 A thin layer of praline feuilletine au speculoos is first pressed into the base of the tartlets with the back of a dessert spoon or offset spatula. The set ganache layers are then stacked together with the feijoa jelly before being robed with the chocolate glaze. 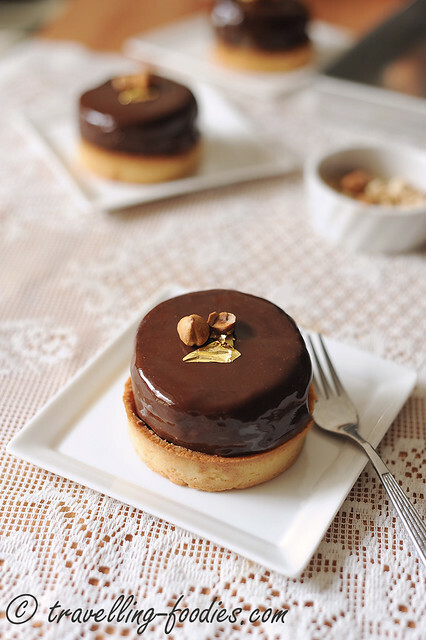 These are then placed carefully over the praline feuilletine layer and finally the tartlets are garnished with roasted hazelnuts and gold leaf. Several things came to my mind when I first had everything together. Firstly, the layers are far too thick than what they really ought to be. That is when the greediness in me sets in. Will probably try to work thinner layers next time, Secondly the temperature of the glaze was too low before being poured over the ganache and jelly layers. This resulted in uneven robing of the ganache as the gelatine component in the glaze set and thickened too quickly in some areas. These are things which I need to keep in mind and work on for future. On a positive note, the tartlets taste really good! I’m surprised that the pairing between feijoa and dark chocolate worked out so well. Maybe it would be good to explore other possibilities on working with feijoa next time! Cream butter with icing sugar with a wooden spatula or whisk until pale and fluffy. Add beaten egg a bit at a time and mix well in between additions. Add almond powder and mix well. Carefully mix in pastry flour until the dough just comes together. Roll out over clingfilm or baking sheet and chill until firm, best overnight. Roll out pate sucree until 2-3 mm thick and dock evenly. Cut out with tart rings and “foncage” pieces of pate sucree over tart rings. Bake blind at 160 degrees celsius for 15-18 min until nicely brown. Melt milk chocolate over bain marie or in microwave. Stir in speculoos paste to homogenise. Add in praline feuilletine and chopped hazelnuts and mix well. Set aside. Add feijoa pulp to granulate sugar and mix well. cover with clingfilm and macerate overnight in the fridge. heat macerated feijoa pulp with water over the stove until mixture reaches at least 65 degrees Celsius. Take off heat and stir in reconstituted gelatine powder and mix well to melt completely. Heat whipping cream with glucose until bubbles starts to form around the perimeter of the pot. Pour over chopping dark chocolate in a mixing bowl and leave to stand for 1-2 min. Add butter and salt and mix well. Pour into mould rings and cover with cling film. Refrigerate to firm up. Take off flame and cool to around 60 degree celsius. 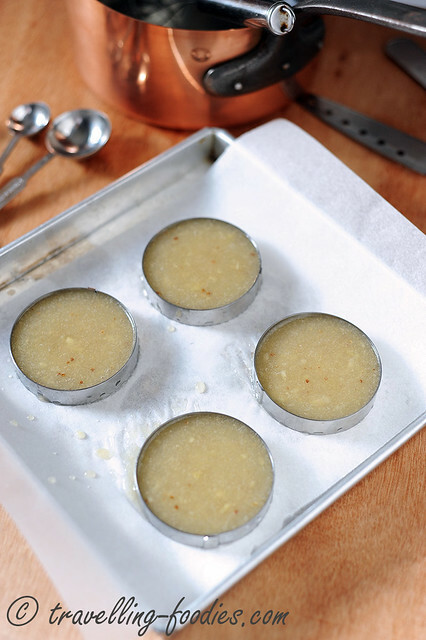 Add reconstituted gelatine sheets and mix well to melt. Strain the mixture and set aside to cool until it is around hand temperature. Keep warm and set aside until needed. Over the base of the baked pate sucree shells, brush with a thin layer of melted chocolate. Add a spoonful of praliné feuilletine au speculoos and spread evenly over the base with the back of the dessert spoon or offset spatula. Over a wire rack with a plate beneath, stack the discs of gelee au Feijoa and ganache au chocolat noir. 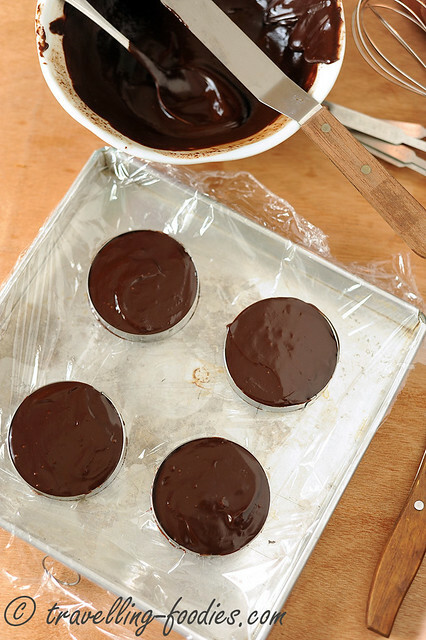 Pour a thin layer of glacage au chocolat over the surface of each ganache discs. Smoothen with offset spatula if necessary. 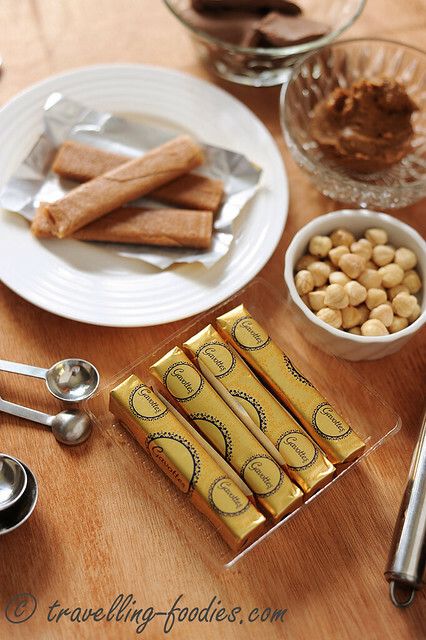 Decorate with feuille d’or and roasted hazelnuts and chill until ready to serve. This entry was posted on May 18, 2015 by Alan (travellingfoodies). It was filed under Food, Simple Eats and was tagged with biscuit gavotte, dark chocolate, feijoa, feuille d'or, french pastry, ganache au chocolat noir 70% cacoa, gelee au feijoa, glacage au chocolat, gold leaf, maceration, pate sucree, patissier, pâtisserie, praline feuilletine, speculoos, Tartelette au Feijoa et Chocolat Noir, zeijoa. Such an elegant looking piece of edible art. thanks Edith! lots of room for improvement though… especially the glaze! The composition doesn’t look simple to me at all, this looks delicious as always. Morning Alan: These looks so delicious. separate steps, and it isn’t so daunting. I’m wondering what could be substituted for the freijoas, if I can’t get them here. What size rings or biscuit cutters did you use? These tarts look so perfect! 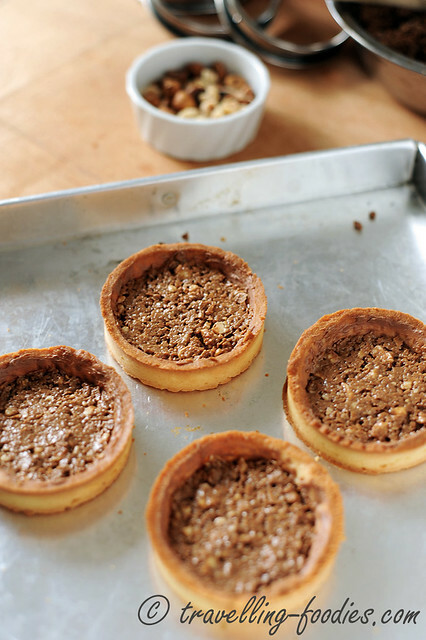 I’m currently stuck 1) finding a good tart recipe, and 2) baking a set of perfect tart shells. I’d love to give your tart recipe a try. 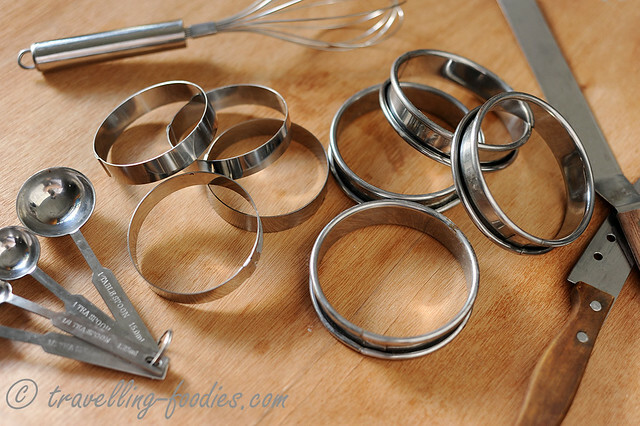 Do you have any tips for lining tart rings and baking tart shells? 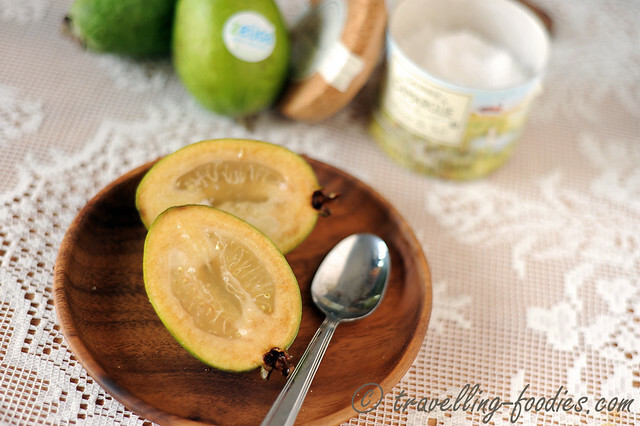 Now that I’m situated in Australia, I’ve been seeing tons of feijoas in the market recently but didn’t know what to do with them! the gelee sounds like a fantastic idea! You know what? I was just visiting your big earlier today checking out the baking supplies outlet in HK. Didn’t realise you’d relocated to Sydney and finished your LCB course! Congrats!